Fig. 1. 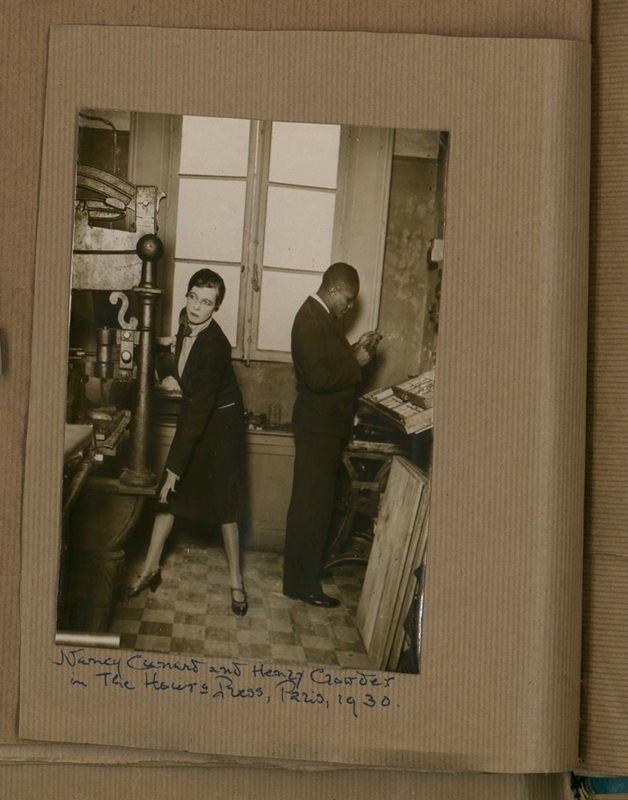 Exemplary of the kind of collaborative work that characterized small press production in the modernist period, Nancy Cunard and Henry Crowder are seen here printing together at the Hours Press, Paris, 1930. Crowder began working alongside Cunard in 1928. Image courtesy of the Modernist Archives Publishing Project, with thanks to Robert Bell, literary executor to Nancy Cunard. This photograph of Cunard and Crowder offers one point of entry into the politicized intimacy of that space, and a glimpse of the shared work of book production in practice. Cunard is at the press, pulling prints, and Crowder, the compositor, stands behind her at the type cases, setting type. There is hardly any space between them in the small room. The cramped quarters depicted here highlight the domestic scale of the enterprise, and the image offers a visual snapshot of the strenuous, iconoclastic effort of two publishing industry outsiders to “make [books] new” by differently embodying the conditions of their making. Cunard’s undertaking of the machining and Crowder’s typesetting subvert several intersectional identities. In the late 1920s, women were not usually working as printers (though they predominated in secretarial roles in publishing houses or packaged books for sale and distribution) and black men were almost always segregated from white laborers. Cunard and Crowder’s romantic relationship heightened and complicated their closeness, making them a target of invidious prohibitions against interracial fraternity, professional or romantic; their collaboration helps us understand more keenly that even the smallest of modernist book publishing operations, like the Hours Press, relied on creative unions that were never straightforward and were social, emotional, political and cultural experiences as much as they were acts of collective labor. Building the Modernist Archives Publishing Project (MAPP), a critical digital archive of materials related to modernist book publishing at a historical juncture when Digital Humanities work on modernist book history is still in its nascency, we have been highly attuned to what feminist scholars have long understood as the situatedness of our own efforts to access, digitize, aggregate, and animate the networked relationships amongst thousands of documents in widely dispersed international archives. While our ambitions are large and hope to embrace many presses over time, we have focused our early efforts on a medium-sized press that was, in fact, the inspiration for Cunard’s own, and with whom she had published her 1925 poem, Parallax: Virginia and Leonard Woolf’s Hogarth Press. The creative, collaborative, and critical efforts that have gone into excavating the Hogarth Press archives and devising a rich metadata structure supporting them remind us that publishing—old and new, coterie, commercial, or academic—constitutes a creative industry, and that its actors and their stories shape the final “product.” Jacqueline Wernimont, citing the work of Chris Bourg and Bess Sandler in her introduction to a special issue of Digital Humanities Quarterly (DHQ) on Feminisms and Digital Humanities, argues that “self-disclosure . . . is an important design and accessibility feature in feminist work.” This turn to “disclosure” or “creative critique,” both personal and intellectual-historical, has been a signal feature of our collaborative practice. It also undergirds our efforts to use digital affordances to disclose or reveal the paperwork of modernism where invisible, frequently collaborative actors reside in the shadows of dominant narratives about authorial and textual autonomy. Fig. 2. 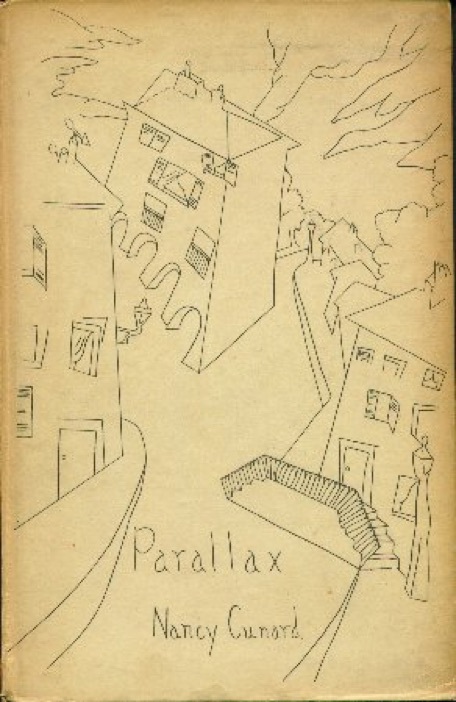 Nancy Cunard’s Hogarth Press publication "Parallax" (1925) predated her own Hours Press experiment in publishing. The cover was designed by Cunard’s friend, Kansas-born painter and musician Eugene McCown. The Woolfs warned Cunard off starting a press of her own: “Your hands will always be covered with ink!” (These Were the Hours, 8). Image courtesy of the Modernist Archives Publishing Project. In his essay in this cluster on the importance of modernist literary editors, Nikolaus Wasmoen argues that drawing attention to the nonauthorial participants in the creation of modernist periodicals allows us to unpack some of the (often self-generated) myths of creative autonomy in the making of modernism and to understand cultural production as a social act. As Wasmoen’s work on the “unassailable data” of modernism and its digital legacy shows, resources such as the Modernist Journals Project, now approaching its twentieth anniversary, allow us to see and trace historical text-producing relationships more clearly than subsequent editions or anthologies which strip texts of their original material packaging. Fig. 3. 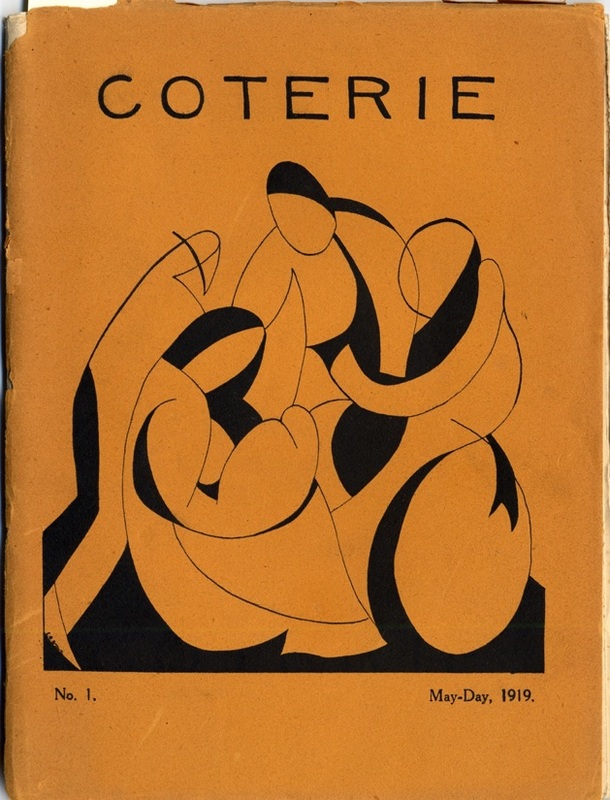 An example of the cover art available at the MJP, often stripped from library bound issues of magazines: Coterie 1 (1919), published by Frank Henderson’s Bombshop and founded by Indian law student Chaman Lall. The artist’s signature bottom left appears to read E. R. Brown. Courtesy of the Modernist Journals Project. As paper pages become transformed into digital entities, new scholarly collaborations are forming that are also drawn on distributed labor, shared social experiences, and (hopefully) models of mutually fulfilling teamwork. As Marjorie Stone and Judith Thompson note in their introduction to their edited collection on literary collaborations and authorship, new challenges remain for scholars now as we cross disciplinary and historical boundaries and confront the challenges of collaborative work. They suggest that there is a pressing need to move from paths of investigation that “are parallel, not converging or intersecting,” to modes of inquiry that truly bridge and combine. What do the ambitious collaborative projects that are the norm in DH mean for modernist studies, broadly speaking? And what interventions into the field of scholarly production do we want to make as “fellow-workers” in the business of making modernist resources (Cunard, These Were the Hours, 46)? We believe a feminist approach to digital design and curation within the fields of publishing history, digital humanities, and modernist studies more broadly), remains particularly vital in a contemporary culture that still sees technology, even humanities-related uses of technology, as a male-dominated field. At MAPP, we embrace a feminism of archival recuperation (where in the paper archives do previously lost or under-recognized stories of women’s labor in the book trade reside? 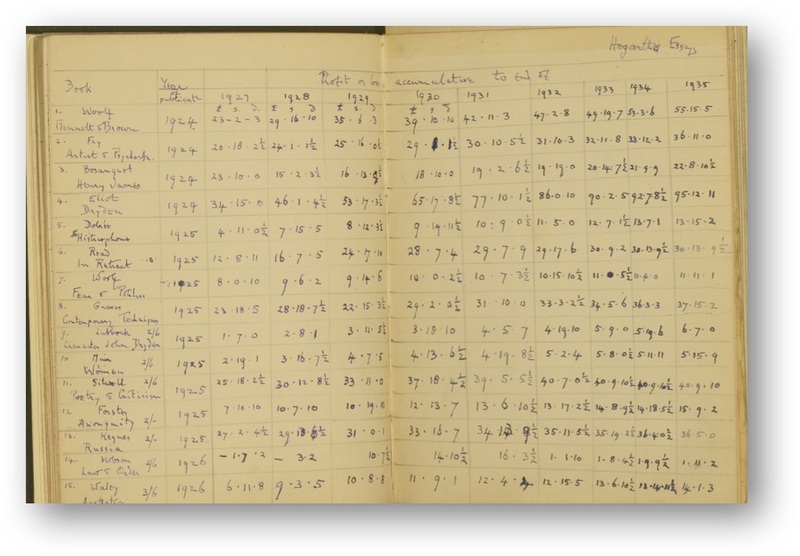 ), of metadata structure (how can we make spreadsheets capture the traces of obscure labor? ), and of scholarly practice (why is collaboration in academic humanities research still hard to categorize and credit?). This model necessitates working together on digital resources with an explicitly feminist ethos rooted in what Lisa Marie Rhody has described affirmatively as the “productive discomfort” that comes from a feminist awareness that large-scale institutional structures—technological, social, and cultural—can default all too readily into orthodoxy. We seek to engage but to go beyond recovery as a feminist goal, to be transparent about the gender dynamics of our own scholarly moment as well as those pertaining during the production of the modernist books we are now turning into digital texts, objects, and analyzable and visualizable data. Through multiple, intersecting acts of collaboration—in building, brainstorming, writing, and theorizing—the authorial voice expands into a chorus of voices, continually writing and thinking in concert. Literary history had come under attack from theorists of various stripes: as monologic and as reifying a centrist, progressivist, exclusionary account of national literatures. The collaborators felt that by treating women’s writing as the center, not the margins, by weaving together a host of distinct narratives linked by synchronicity, and by exploiting the power of the new electronic medium, they could counteract these tendencies. Susan Fraiman goes even further in contending that the very nature of Orlando’s form is part of its radical contribution to feminist history. Users’ ability to “rifle through and remix its constituent parts is what distinguishes Orlando so dramatically from such traditional reference works as Janet Todd’s British Women Writers (1989) or Joanne Shattock’s Oxford Guide to British Women Writers (1993).” Brown, Clements, and Grundy exhort feminist scholars to be “not just consumers of technology, but producers of technological tools that suit our aims and methodologies.” If Cunard had to cover her hands in ink and learn to print in order to publish the kinds of modernist texts she wanted to see in the world, and if Virginia Woolf had to begin a “press of one’s own” in order to publish her own novels as she wished, we as feminist scholars have to do likewise, the Orlando team argues, and learn how to configure, use, and analyze the digital resources that now distribute modernist texts to readers. We are attentive to Wernimont’s warning about a balance between size and access in terms of feminist digital projects, in our creation of an archive that highlights a “process” (layers of production) that involves and challenges users, as well as “recovery” (access to hard-to-find works). Digital forms, unbound from the codex and arguably more malleable and various, as Fraiman notes, for one thing allow us to explore the potential for creating relational histories of modernism. Digital databases and archives allow us to chart these relationships in a way that considers not only feminist scholarly predecessors like Bonnie Kime Scott, whose “tangled mesh of modernists” diagram remains foundational, but also the models, structures, and standards of digital preservation. Fig. 4. 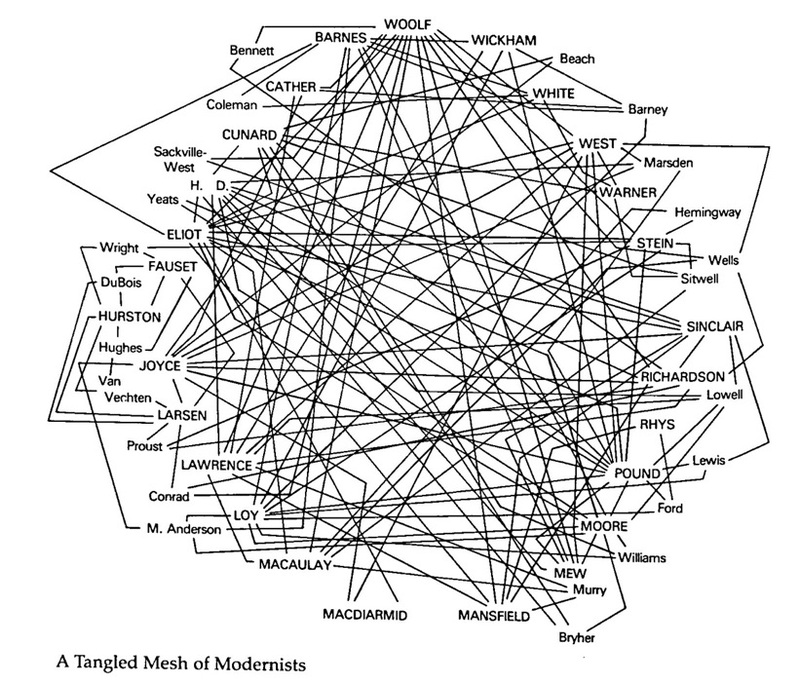 Bonnie Kime Scott’s foundational network diagram "A Tangled Mesh of Modernists" from The Gender of Modernism, ed. Bonnie Kime Scott. In their article “Modernism Meets Digital Humanities,” Stephen Ross and Jentery Sayers argue that, despite the relative paucity of digital output in “the domain of modernist literature and culture,” the intensified critical turn in the “new modernist studies,” with its emphasis on “the relationships between individual works and the cultures in which they were embedded,” should catalyze innovation at the intersection of modernist studies and DH. It’s true that much work in digital humanities—including the “Linked Modernisms” project, and the “Orlando Project”—has fundamentally been on relationship building, from the personal to the small group; the technological to the institutional; the “lost” archival artifact to its visual resurfacing in the digital public sphere. Fig. 5. 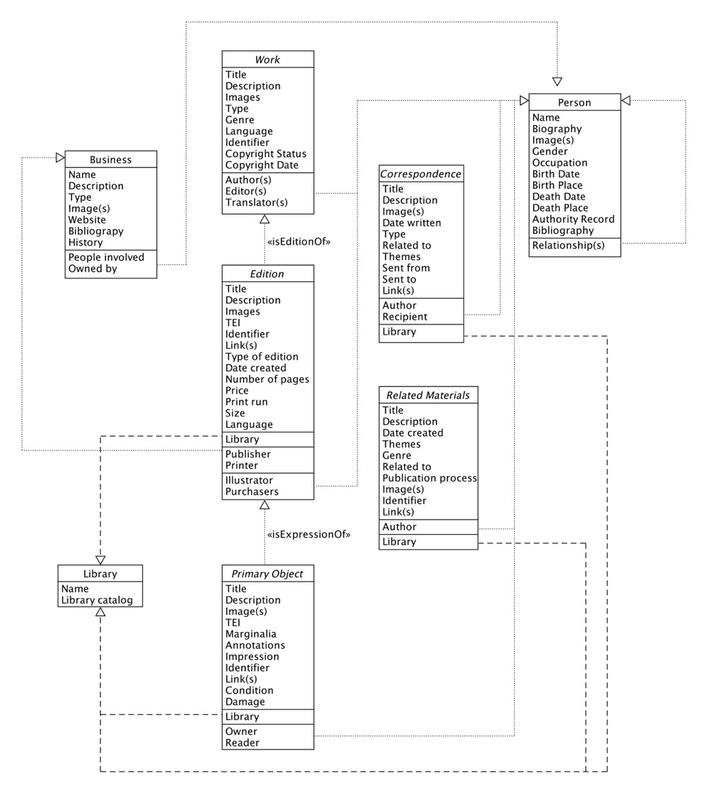 The Modernist Archives Publishing Project Data Model. Animating the history of books in a digital context, though it is just now beginning to be done, can be similarly fruitful, and can provide layers of documentation that go beyond first editions and first instances of texts and use archival material to lay bare some of the dynamics of collaboration that underlie the making of modernist texts. We designed our data model for MAPP (fig. 5) with these dynamics in mind, ensuring interconnections can emerge in any search. In historical terms, a feminist approach to publishing is particularly crucial because the mainstream book publishing industry of the twentieth century was manifestly patriarchal. Victorian presses bearing the names of men and their sons dominated the book trade in the early part of the twentieth century: Grant Richards, Macmillan, Duckworth and John Lane, to name just a few. In general, men worked as editors, as booksellers, as travelers, and as publishers’ readers. The Publishers’ Association, founded in 1896, counted mostly men among its members. The modernist presses we know best in the field are actually the exceptions to the publishing industry rule of “X and Sons.” Hence we have not only Cunard and Crowder, but also Leonard and Virginia Woolf’s Hogarth Press, Blanche and Alfred Knopf’s endeavor, Caresse and Henry Crosby’s Black Sun Press, and Laura Riding and Robert Graves’s Seizin Press, not to mention quite a number of all-female lineups such as Sylvia Beach and Adrienne Monnier’s Shakespeare and Company and Le Navire d’Argent, the Yeats sisters’ Cuala Press, Gertrude Stein and Alice Toklas’s Plain Edition, and Margaret Anderson and Jane Heap’s The Little Review, which was for a time due to funding difficulties produced from a tent on the shore of Lake Michigan. These are exceptional examples, but they are worth highlighting using an historical approach that, like the Orlando Project, seeks to draw attention to the important roles that women played in shaping not only the authorial but also the publishing contexts of modernism. Our work as collaborative digital scholars revisits the motivations of these modernist feminists building presses of their own. In its beginnings, work in modernist magazines, bookshops and presses was intended to be revolutionary, to challenge moribund institutional structures, just as DH is stirring academic debate today. Many of the same opportunities and challenges confront us: the desire to create an audience for our work; the pleasure of DIY-entrepreneurial endeavor; the productive sense of collective pursuit; the epistemic ambition to create new knowledge about the past by collating fragmentary material artifacts not to “shore against our ruins” but to revitalize new humanities research. Fig. 6. An array of modernist publishers: the “Presses” page: Modernist Archives Publishing Project. Fig. 7. 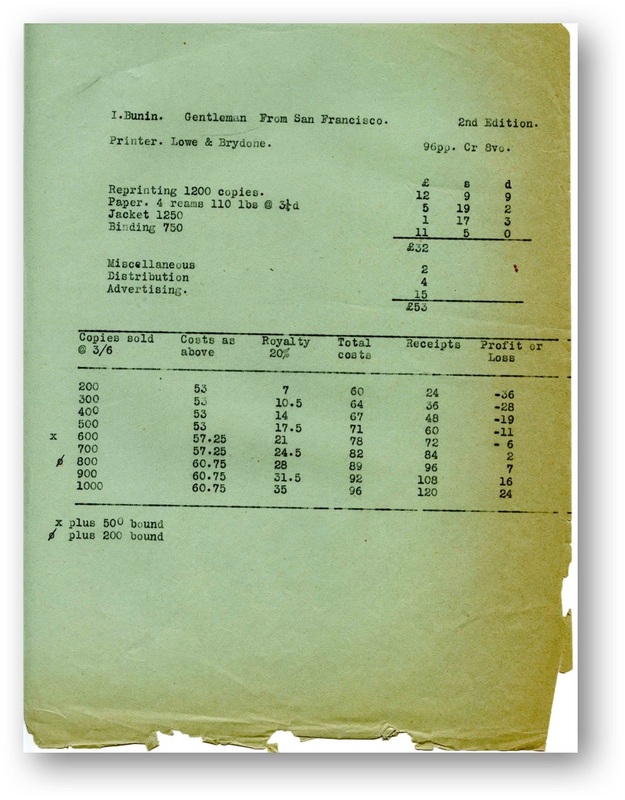 Figures 7-9 offer samples of some of the archival materials currently on display in the MAPP resource, including production documents, sales sheets, dust jacket illustrations, financial figures, and many more. The image above depicts a Hogarth Press Production sheet for I. Bunin’s The Gentleman from San Francisco. Hogarth Press Archive, University of Reading. Image Courtesy of the Modernist Archives Publishing Project. Fig. 8. Hogarth Press Account Book. Hogarth Press Archive, University of Reading. Image Courtesy of the Modernist Archives Publishing Project. The MAPP team is currently at work on a transcription project rendering these hand-written accounts into machine readable data. Fig. 9. 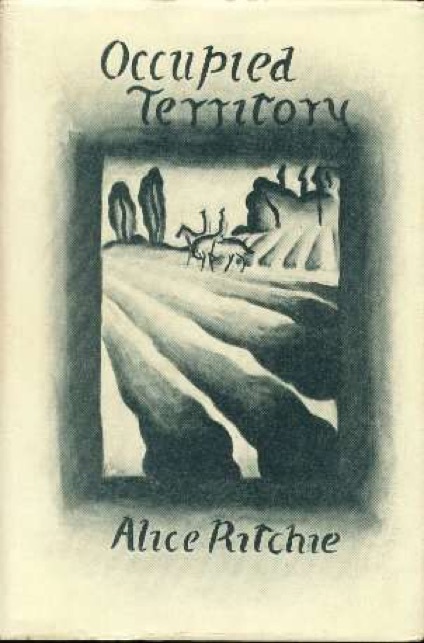 Cover Design for Alice Ritchie’s Occupied Territory (1930) with cover design by her sister Trekkie Ritchie (Parsons). Image courtesy of the Modernist Archives Publishing Project. David James and Urmila Seshagiri, “Metamodernism: Narratives of Continuity and Revolution,” PMLA 129, no. 1 (2014): 87–100. Jeremy Braddock “Media Studies 1932: Nancy Cunard in the Archive of Claude McKay,” Modernism/modernity Print Plus 3 no. 2 (2018). Staffing records in publishers’ archives document female labor at the houses, though they are given relatively little space in narrative histories of commercial firms. Alysoun Sanders and John Handford have recently used staff lists to reconstruct the labor landscape of Macmillan through the archives, but more such work on labor practice in publishing deserves to be done. John Handford and Alysoun Sanders, “Letters from Macmillan: A Publisher’s Perspective.” Presented at the House of Macmillan Conference, University of Reading, June 2016. These included the prohibitions, as Braddock points out, of Cunard’s own mother, who disowned her because of her relationship with Crowder, see “Media Studies 1932”; Crowder’s impressions of these years were later published in As Wonderful As All That? Henry Crowder’s Memoir of His Affair with Nancy Cunard, 1928–1935 (Navarro, CA: Wild Trees Press, 1987). Cunard notes that the Woolfs initially warned her off starting a press: “Your hands will always be covered with ink!” (These Were the Hours, 8). Wernimont, Jacqueline, “Introduction to Feminisms and DH Special Issue,” Digital Humanities Quarterly 9, no. 2 (2015). Scholarly Adventures in Digital Humanities: Making the Modernist Archives Publishing Project, by Claire Battershill, Helen Southworth, Alice Staveley, Michael Widner, Elizabeth Willson Gordon, and Nicola Wilson (London: Palgrave Macmillan, 2017), offers a fuller account of our collaborative methods. Like our DH project, which focuses in its initial phase on one press, the Hogarth Press, but intends to branch into others, the MJP began by digitizing one magazine, A. R. Orage’s The New Age, and expanded thereafter. See Sean Latham, “The Mess and Muddle of Modernism: The Modernist Journals Project and Modern Periodical Studies,” Tulsa Studies in Women’s Literature 30, no. 2 (2011): 407–28. Marjorie Stone and Judith Thompson, eds. Literary Couplings: Writing Couples, Collaborators, and the Construction of Authorship. (Madison: University of Wisconsin Press, 2006), 309. Lisa Marie Rhody, “Why I Dig: Feminist Approaches to Text Analysis,” in Debates in the Digital Humanities, Matthew K. Gold and Lauren F. Klein, eds. (Minneapolis: University of Minnesota Press, 2016), 536–39, 537. It is crucial to note that Orlando’s own initial infrastructure (a digital resource with access through Cambridge University Press) was a product of its moment: there has been much progress in the development of open source tools for building digital humanities resources in the twenty years since Orlando began. The new initiatives in which Orlando is participating, including the Canadian Writing and Research Collaboratory (CWRC), reflect these changes and developments even as Orlando itself remains under the CUP imprint. Susan Brown, Patricia Clements, Isobel Grundy, Sharon Balazs, and Jeffrey Antoniuk, “The Story of the Orlando Project: Personal Reflections,” Tulsa Studies in Women’s Literature 26, no. 1 (2007): 135–43, 135. The radical allusiveness of Virginia Woolf’s 1928 novel, Orlando, itself nodded at in this formative DH project, has recently been explored in Sentencing Orlando: Virginia Woolf and the Morphology of the Modernist Sentence, ed. Amy Bromley and Elsa Hogberg (Edinburgh: Edinburgh University Press, 2018). Susan Fraiman, “In Search of Our Mothers’ Gardens—With Help from a New Digital Resource for Literary Scholars,” Modern Philology 106, no. 1 (2008): 142–48, 142–43. Susan Brown, Patricia Clements, and Isobel Grundy, “Sorting things in: Feminist knowledge representation and changing modes of scholarly production,” Women’s Studies International Forum 29, no. 3 (2006): 317–25, 318. Emphasis in original. Jacqueline Wernimont, “‘Whence Feminism?’ Assessing Feminist Interventions in Digital Literary Archives,” Digital Humanities Quarterly 7, no. 1 (2013). Stephen Ross and Jentery Sayers, “Modernism Meets Digital Humanities,” Literature Compass 11, no. 9 (2014): 625–33, 625.